A business stakeholder (project manager, account representative, etc.) is faced with an all-too-familiar challenge: his client requests a quote for developing a new application within a very short timeframe, and not much information about scope to go on. In this webinar, QSM's Laura Zuber shows how the business stakeholder can produce a Rough Order of Magnitude (ROM) estimate on the spot, using QSM's web-based solution, SLIM-WebServices. 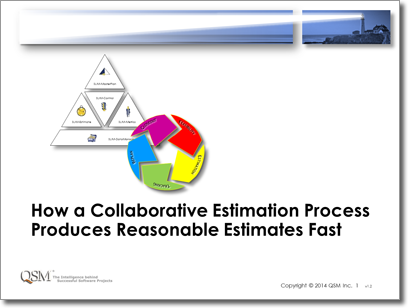 Follow his process as he collaborates with corporate estimation specialists to refine those initial estimates as they advance to more detailed stages. By incorporating contributions of a variety of project stakeholders in the estimation analysis process, the business stakeholder is able to make better business decisions.